Puff pastry and cherry tomato tart tatin topped with roasted red mullet and fresh rocket. Preheat the oven to 200°C (GM6). Wash the tomatoes and peel the garlic. Prepare the pesto by blending the basil leaves, garlic, pine kernels, olive oil and parmesan together in a food processor or pestle and mortar. Cut rounds from the puff pastry slightly larger than the tart tins. Place the cherry tomatoes in the tart tins and add a teaspoon of honey to each one. Brush the pastry rounds with pesto and place them on top of the tomatoes. Bake for 20 minutes. Remove any bones from the fillets of red mullet and season them with fine sea salt. Place them on a baking mat with a splash of olive oil and a pinch of Piment Espelette. Bake in the oven for 4 minutes. 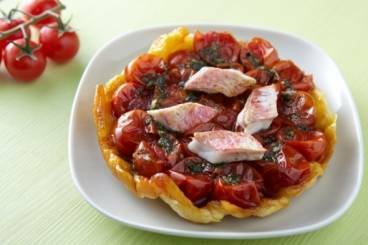 Arrange the tartes tatins on plates, add a fillet of red mullet to each one and garnish with rocket leaves.